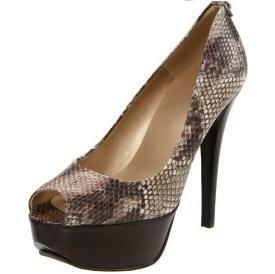 Polish up your warm-weather persona in this simply svelte women’s Snake skin wedge pump by Stuart Weitzman. A magnificent match with spring styles, summer sensations and even fall favorites, the utterly coiffed pump features a shapely linen upper and tasteful tab-and-snap detail, with a cutout toe adding an enchanting spin that’s flawless with bare skin or hose. We’re smitten with the practical rubber sole that keeps you steady on your feet, and you’ll love its 3-1/2-inch wood-look wedge, which adds elegant support and elevation to your picture-perfect stride.